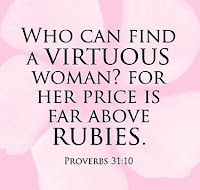 In the article Lies We Women Believe, I mentioned that the woman described in Proverbs 31 does exist. Naturally, some people seem to disagree with me. So, I have decided to let you decide who you feel is personifies the Proverbs 31 woman to inspire all of us wives, mothers and soon-to-be. She serves God with all of her heart, mind, and soul. 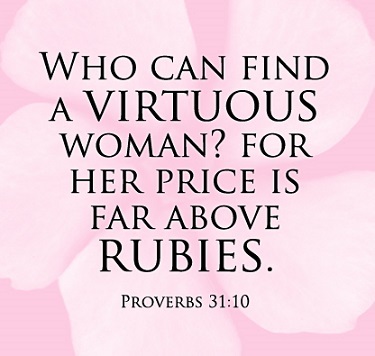 Send in your nominations to ladyijd@yahoo.co.uk with a description of why you think this woman embodies the description of the revered Proverbs 31 woman. We will present the winner* with a gift, a customised Proverbs 31 Woman sash and her picture and story will be published in Covenant Relationships. We want to encourage women to serve God in every aspect of their lives. Being a Proverbs 31 woman is not about be “perfect.” It’s about living life with purpose, diligence, forgiveness, and repentance.